Dear Peter. 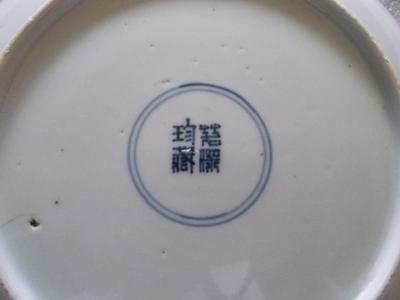 Could you kindly identify the mark on a plate/ dish that I have and how it translates? It is fine hard paste porcelain and very well painted. It's approx 9inches in diameter and 1 1/2 deep. Thank you very much in advance. Sorry, cannot identify this mark. Not sure about two characters. Looks like a shop or studio mark (not a reign mark).